Our goal is to prevent people with mental illness from entering prison, promoting alternative measures and collaborating in the care of those who are deprived of their liberty, through programs designed for maintenance and, where appropriate, reintegration into the community. We develop individualized intervention with intensive monitoring in the community and arrange home visits, support for daily life, coordination with mental health resources, and other community resources. Through the Plan of Comprehensive Attention to People with Mental Illness (PAIEM) of penitentiary institutions, we work closely with the penitentiary center teams and provide guarantors of accompaniment permits. We design personalized plans for social and labor inclusion for people who are serving prison sentences. 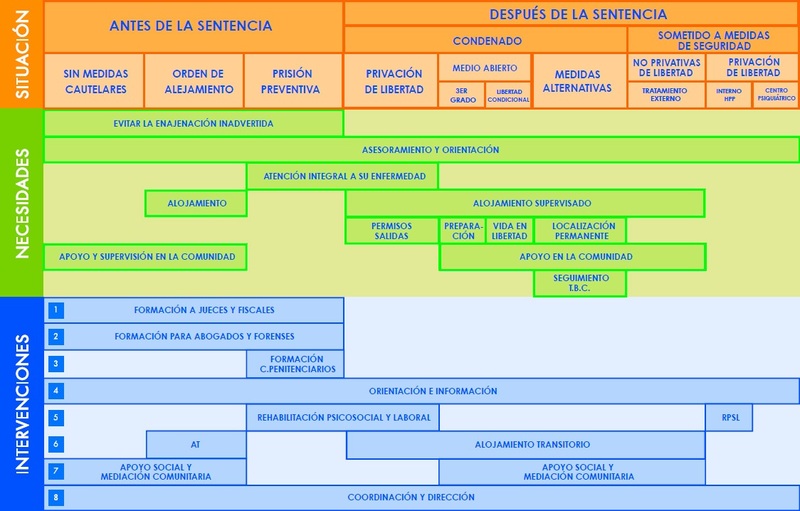 In the “la Caixa” Re-entry Program we prioritize the social role of “working person” over that of “sick and delinquent person,” facilitating the recovery process by impacting personal identity. This program, launched in consultation with Janssen, offers a residential alternative to those with mental illness who, due to lack of adequate family and social support, have difficulty accessing exit permits, third degree prison, or conditional freedom.